Bordeaux immigrant Jean Laurent came to California in 1852 to seek gold but instead founded one of the first wineries in Napa Valley. Laurent built his first winery in 1874, which was a modest wooden structure. Business was good and in 1879 he built the stone cellar that is the heart of the present-day winery. Laurent was one of the largest producers in the California wine boom of the 1880s. In those days, wines were sold in bulk and shipped by train to the east coast. After Laurent's death in 1890, the winery continued operating under a succession of owners. Bruce Markham arrived in Napa Valley almost 100 years later, also looking to start a winery. He purchased vineyards in Yountville, Oak Knoll and Calistoga and the old Laurent winery, which was operating as a cooperative at the time. In 1978, he founded Markham Vineyards and the old Laurent winery was reborn. Markham focused on Cabernet Sauvignon in its early days and introduced the Markham Merlot with the 1980 vintage. From 1978 to 1988 the winery's production increased from 3,500 cases to 20,000 cases. The wine quality and praise from wine critics and consumers increased as well. In 1988, the old Laurent Winery once again rose like a phoenix to take on another new life. The winery was sold to Mercian Corporation and began an ambitious four-year, multi-million dollar renovation, expansion and vineyard-replanting program. These efforts would more than double the capacity and make Markham one of the most advanced, stunning winemaking facilities in the country. 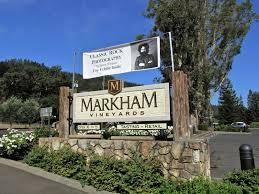 Even through the dust of the renovation, Markham was able to produce three of the number-one rated wines from California, as judged by Wine Spectator magazine. Wine Spectator 91"Supple and lively, yet with appealing structure, showing notes of red raspberry, toasted spice and subtle herb. This is what Merlot is all about in California"
" A true Napa Valley blend of vineyards! Our Estate vineyards provide the backbone for the blend, totaling almost 65% of this bottling. Merlot from Oak Knoll gives sour cherry character while the Yountville components provide the classic Bing cherry aromas and flavors for which our Merlot is known. Wine Enthusiast 90"Shows the soft, supple side of Merlot, with smooth tannins framing earthy flavors of sour-cherry candy, herbs and cedar. Ready to drink now. " Wine Spectator 91 "Sleek and well-focused, with appealing aromas of red currant and toasty tomato leaf that lead to rich flavors of plum, mocha and cedar. Tannins firm up the finish. Drink now through 2017." Dark ruby color. Black pepper and tobacco aromas swirl around the cherry cola core.